The Angel Hotel after closure (1980s) with this photo from 2018. Publicans are listed back to 1802, the Grade 2 listed building was closed as a pub/hotel in the 1980s. It became a Burger King and in 2018/19 is a Bonmarche clothes shop. The listing states that The Angel Inn is now O'Neills but this probably refers to the licence as a substitute pub was built at the rear and faces onto Station Road. 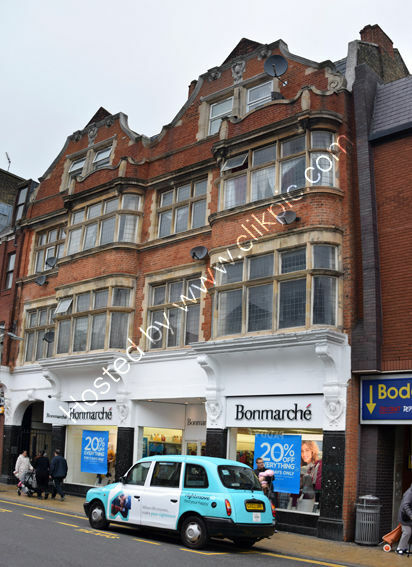 The rooms above the Bonmarche are flats (again 2018) and are accessed through the coach opening to the left. This will have once been a grand entrance as there is a tiled column there that looks (to my untrained eye) to be Victorian and possibly Doulton Lambeth. For commercial use of this photo please go to Alamy.com and search for RDM2B5 but for a one off print, please see below.